Police responded to a report of a home invasion. When they arrived, they found the homeowner reported shooting someone who forced entry into the home. The suspect is hospitalized with a gunshot wound and is being treated. The incident is being investigated. The sheriff's office announced Wednesday morning that Hamm-Brown has now been charged with Deadly Conduct and Aggravated Assault in connection with the shooting. His bond has been set at $125,000. 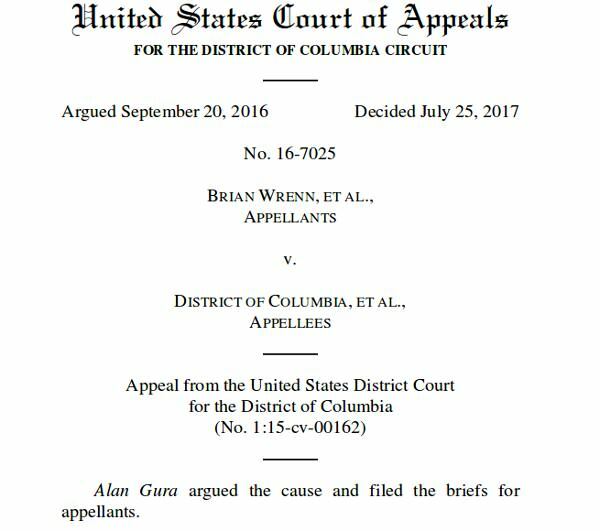 The U.S. District Court of Appeals for the District of Columbia has refused to grant a petition for an en banc hearing in the Wrenn v. D.C. Second Amendment case. The Court earlier ruled that the requirement for a "good cause" to issue a concealed carry permit was unconstitutional. In effect, this means in a week the District of Columbia will become a "shall issue" jurisdiction. If a person meets the legal requirements for a concealed carry permit, the District of Columbia will be required to issue a permit. Upon consideration of the petitions of the District of Columbia, et al., for rehearing en banc, the joint response thereto; and the absence of a request by any member of the court for a vote; the motions of Everytown for Gun Safety for invitation to file briefs as amicus curiae in support of the petitions for rehearing en banc and the lodged briefs, it is ORDERED that the motions be granted. The Clerk is directed to file the lodged documents. It is FURTHER ORDERED that the petitions be denied. * Circuit Judge Wilkins did not participate in these matters. "Ten years ago, Washington D.C.'s political leadership tried to extinguish Second Amendment rights before the Supreme Court," noted attorney Alan Gura, who represents the plaintiffs. "The result was D.C. v. Heller, a tremendous victory for the rights of all Americans. With the court of appeals again confirming the people's right to bear arms, Washington, D.C.'s politicians must once again ask themselves whether it makes sense to keep resisting our fundamental rights." The District of Columbia government can appeal the case to the Supreme Court. The Court has shown considerable reluctance to hear Second Amendment cases on the issue of bearing arms. The Supreme Court refused to hear the Peruta case from the Ninth Circuit in June of this year. There is a clear split in the Circuits on whether Second Amendment rights extend beyond the home. The question seems absurd to those who have studied the history of the Second Amendment. Ordinarily, the Supreme Court would be expected to hear a case to resolve the contradictory rulings. Second Amendment cases have been anything but ordinary. There is a long history of state and local governments refusing to protect the right to bear arms. It started in the 1830's, when restrictions on the carry of concealed weapons were first upheld in some states, after the Supreme Court ruled that the Bill of Rights did not apply to state governments. The issue was supposed to be settled with the 14th Amendment, after the War Between the States, in 1868. The Second Amendment was supposed to be protected for all citizens, including the recently freed slaves. It has taken nearly a hundred and fifty years to implement that protection. The fight to do so continues. The victory comes on the eve of the 32nd annual Gun Rights Policy Conference in Dallas, Texas. The event is co-sponsored by SAF and the Citizens Committee for the Right to Keep and Bear Arms. It will be a hot topic among the attendees. Knightdale, N.C. — A woman who officials say shot an intruder in her office building on September 18 is claiming she did so in self-defense, according to her attorney. The claim comes as response to a statement from the suspect's family, who is demanding she be charged for her actions. It has been more than one week since Connie Wells shot Deondrea Branch, a larceny suspect, at her CPA firm after he stole 10 bras from a nearby Walmart. The State Attorney's Office said Ollie Plunkett acted in self-defense in the shooting death of Deanna Stevison and no charges will be filed. The shooting happened back on June 8 at Fairfield Village Apartments. Plunkett told investigators she was sleeping and was woken up by a banging on the front door early that morning. Plunkett told Escambia County Sheriff's Office deputies that her daughter opened the door and Stevison forced her way into the home. The State Attorney's Office said Stevison attacked the daughter and then turned on Plunkett when she tried to intervene. At some point, the gunman also pistol-whipped a church usher, causing “significant injuries” to the man, Aaron said. The usher, 22-year-old Robert “Caleb” Engle, confronted the gunman, police said, and during a struggle, Samson was wounded by a shot from his own gun. The usher then ran to his car and retrieved a handgun, police said. Provided, That a municipality may not prohibit a person with a valid concealed handgun permit from carrying an otherwise lawfully possessed firearm into a municipally owned recreation facility and securely storing the firearm out of view and access to others during their time at the municipally owned recreation facility. That ruling, issued last week, finds that “individuals with a valid license to carry a concealed weapon” may legally take their gun into a municipal recreation center that is “not leased or used by the Board of Education for school activities, events or functions” if it is securely stored. Storage in a locked locker is also an option, but Judge Stucky found the City of Charleston is not required to provide locks and cases for as much. That part of the case case is a win for the WVCDL. Other parts of the ruling were less reasonable. The Judge ruled that the West Virginia constitutional requirement for "a thorough and efficient system of free schools" includes a requirement for a "safe and secure environment" at schools, and that translates into a requirement for a ban on guns in schools. That finding is against all common sense and history. Guns were not banned from schools for generations, and there were very few school shootings. It is only after the federal government banned guns in schools that school shootings become much more common. The idea that adults should be banned from carrying guns in schools is a fairly recent one. It particularly gained popularity after the federal government banned guns in schools in the middle of the 1990's. Before that, guns were fairly common in schools for educational and recreational purposes. Ultimately, the ban on guns in schools has been held to be a matter for the state legislature in West Virginia. That is were reforms on the carry of guns in schools will have to be addressed. Sheriff Dar Leaf says a 69-year-old man shot and killed 46-year-old Brian Douglas Reed at a home on Burchette Road, in Prairieville Township Saturday night. Investigators haven't charged the shooter yet, because they believe it could have been in self-defense. The dog began "going after" several people at the apartment complex, Riha said, prompting a man to shoot it one time with a handgun. The dog was taken to a local veterinarian for treatment, but police say its not clear whether it survived. Officers were not able to get in touch with the dog's owner. Early Sunday afternoon, however, the Muncie resident making burglary allegations returned to East 20th Street with three other men, Todd said. This time, the target of the accusation was allegedly battered by two of the men. A few minutes later, three of the men were approaching him when the East 20th Street resident retrieved a handgun from his porch and fired two shots. A bullet struck one of those men in the upper thigh, Todd said, narrowly missing an artery. The victim told deputies he saw the two men through security camera stealing diesel fuel from the bulldozer. According to the criminal complaint, the man and a family member held the suspects until law enforcement arrived on scene. Delaware State Police have released the name of the man killed while allegedly breaking into a Bridgeville-area home late Sunday night. Police say Larry T. Hobbs, a 20-year-old from Laurel, and another man broke into a home in the 11000 block of Iris Field Lane just before midnight. There was someone home, and after a struggle between one of the intruders and the resident, a single bullet was fired from a gun the intruders had, police said. HATTIESBURG, MS (WDAM) - A suspect who died in a Hub City home invasion Sunday night has been identified. Justin Woodland, 17, was killed after being shot by the homeowner, according to Hattiesburg police. NASHVILLE — A gunman wearing a ski mask stormed into a Nashville-area church on Sunday, shooting seven people, including the pastor, before attacking a church usher who ultimately subdued him with a personal weapon, Nashville police said. Police say the man injured during a fight at the Hard Rock Casino parking garage early Sunday morning was shot accidentally by a friend. According to police, the victim and his friend left the casino around 2:45 a.m. and headed to the parking garage. There, they go into a fight with two other people. Police say during that fight, the friend pulled out a gun and fired multiple times; accidentally grazing the victim. Curtis Eykamp told me that at his first day at school in Australia, when the family moved there in 1963, an eight year old girl was bitten and died of snakebite at the school. It was probably an eastern brown. This was the first snake I saw in Australia. The weather is warming up, so the snakes are coming out. I am typing this at the 28 Hotel in Sydney, near the Central train station. I will be leaving to catch a flight to the U.S. this morning. 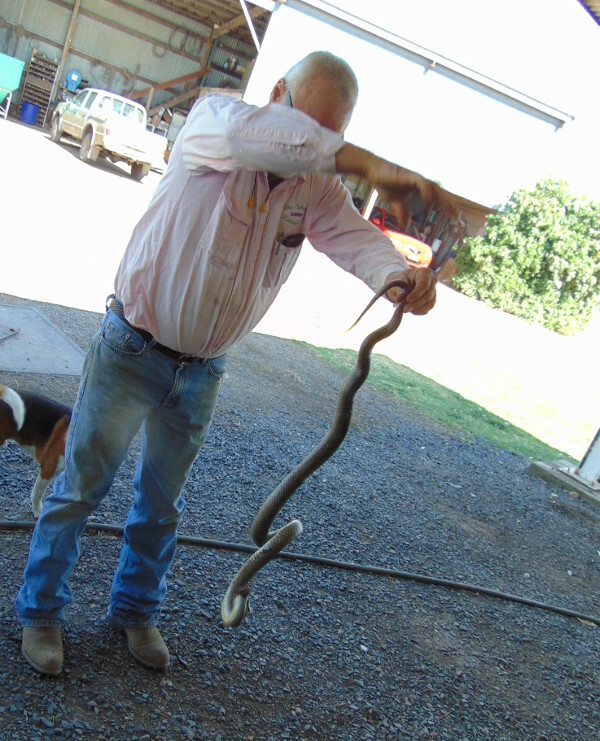 I do not kill snakes without reason, but responsible humans cannot tolerate aggressive, living land mines on a farm with pets and children. It was Sept. 7 when officers responded to a call about a shooting in the 500 block of E. Joyce Drive in Bishop. Police found the body of Evan Frost, who had two bullet wounds to the head and one in the arm. Durbin on Friday said Frost had been shot with a .22-caliber handgun by two female juveniles who Frost sexually assaulted. The shooting, he said, was in self-defense. He declined to specify whether one or both of the girls had shot Frost, or their ages, in order to protect the girls' identities. The home in which Frost was shot was not his residence, police have said. POLSON — A Pablo man involved in a fatal shooting has been released on his own recognizance while investigators look at the possibility of the incident being a case of self defense. Ryan Black, 28, was arrested Sept. 16 and charged with deliberate homicide after he allegedly shot and killed 34-year-old Johnny McKeever outside of Black’s home. A homeowner shot and killed one attempted intruder and wounded another in a shooting early Friday in Lemay, police said. A 19-year-old and a 14-year-old attempting to break into a residence in the 300 block of Shadwell Drive, at the Jefferson Townhomes complex south of Jefferson Barracks, were “confronted by the homeowner and shot,” police said. Spicer was standing behind the suspect as he was on the ground. 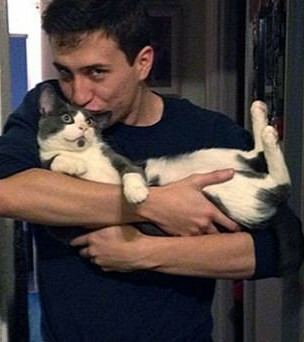 He yelled for help and held him at gunpoint until police arrived. Harold Jackson was taken into police custody, according to the police report. 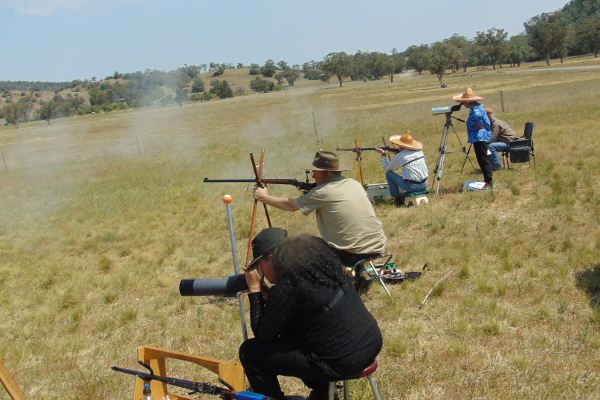 The main event of the Club, is the Billy Dixon Match held at the Nioka Range, near Tamworth in September each year. The Billy Dixon is named after the legendry American hunter and indian fighter who brought the battle of Adobe Wells to an end by shooting the Indian Chief off his horse at 1538 yards. The Nioka Range new range is 1000 yards long with provision to shoot out to 1200. More than black powder shooters shoot at Nioka Range. Matt Miegel has been the driving force behind creating the range. He found a need for a private, long distance range in the shooting community. 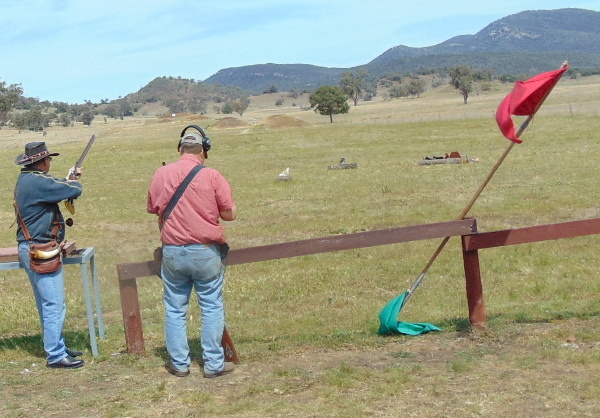 Many clubs have ranges on a lease arrangement. When the owner of the property dies, the lease is often not renewed. Other shooters depended on military ranges. Only 30 years ago, military ranges were common in Australia. Shooting clubs used the military ranges. Now, the military ranges are dwindling and being closed down. Matt saw the opportunity to serve the shooting community and to bring income to the family property at Nioka. The range takes up a thousand acres, but only about 20 acres are closed off from being used for grazing. The range land serves multiple purposes. The shooters have little impact on the land. The local council was, and is supportive of a rural venture that brings cash to the community. When I was at the range a week ago, I heard rumors that the range might be expanded to 1600 meters, a full mile. On this visit, Matt Miegel confirmed the rumor. He said it is a done deal. The 1,600 meter targets should be operational in a few months. Nioka has already been a success with long range rifle shooters. Matt says an average of a hundred shooters attend long range classes at Nioka every month. The instructors are former military. Matt said that people come to a class. shooting six inch groups at a hundred yards, They leave with the ability to make first shot hits on gallon jugs at a thousand yards. Matt is a visionary who made his vision become a reality. The day at Nioka Range was very pleasant. 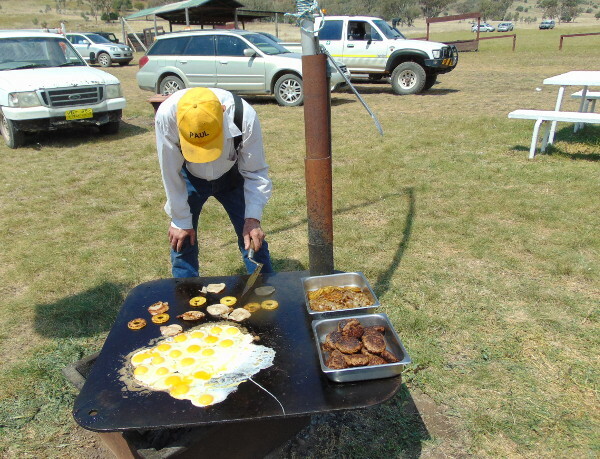 Paul Miegel, the property owner, cooked lunch for the shooters. There is a fellowship in the gun culture, the community of shooters. In most countries, only the elite have access to firearms. Australia has become much more restrictive of firearms ownership in the last 20 years, and seems to be on that path. To be a firearms owner, you need to have resources, time and money. Status in the community is a definite plus. The Australian gun culture is finding ways to overcome the strict regulation, and to prosper. The numbers and percentage of the population that are shooters are growing. The Nioka Range and Matt Miegel are part of that blossoming. After an initial investigation, police believe the teen was trying to enter the residence, and the homeowner shot him, De Foor said. The homeowner was questioned by police then released pending the outcome of a full investigation. When crews arrived at the scene, they said that the resident of the home was still at the scene. Officials say that early investigations show that shots had been fired and one person was reported injured. The suspect was later found by police suffering from two gunshot wounds. The individual was then taken into custody and transported to Smyth County Community Hospital. BRIDGEPORT, Conn. — A burglar was shot trying to break into a home on Kossuth Street in Bridgeport on Thursday, according to the Connecticut Post. A police spokesperson told the Connecticut Post that a resident of a home on the 900 block of Kossuth Street shot the burglar during the attempted burglary. The person who was shot was found at around 5:20 p.m. about a mile away, near the intersection of Barnum Avenue and Central Avenue, according to the Connecticut Post. A church usher confronted the gunman at one point and was pistol-whipped, causing "significant injury around his head." He told police he then went to his own car, grabbed a pistol and headed back into the church. The gunman then shot himself. I arrived on the first day of the 2017 gun amnesty in Australia, 1 July, 2017. I will be returning to the United States on 26 September at the tail end of the three month amnesty. This amnesty is completely different from the mandatory confiscation/turn-in that happened in 1996. In 1996 people were paid to turn in firearms. Some types of guns were effectively outlawed for nearly everyone. Perhaps the strictest firearms regulatory scheme in Western Civilization was implemented on the wave of emotion promoted by the media and John Howard. In 2017, some sanity is returning to firearms regulation in Australia, however fitfully and in small increments. The government is not paying for any guns to be turned in. Guns can be turned in to gun shops to be sold, they can be registered to people who are licensed gun owners; or they can be destroyed. 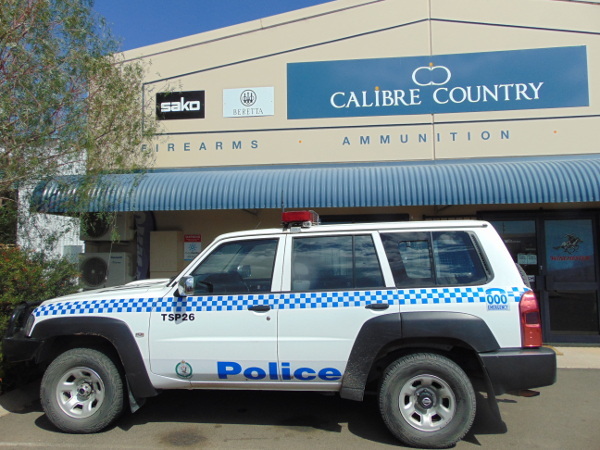 I happened to be at Calibre Country in Tamworth, New South Wales when they turned over 40 guns to the police to be destroyed. Of the guns turned in, quite a few made sense, given the extreme restrictions. It is unlikely that Calibre Country would have been able to sell the 11 common, older, and much used air rifles in the group. An air rifle is considered as much a firearm under Australian law as a double barreled 12 gauge or a pump action .22 rimfire. The costs for keeping air guns are as expensive as for keeping real firearms. There is little sense in keeping old and marginal air guns. There was the old H&R Young American .22 revolver, a couple of sawed off rifles, 17 rusty, beat up .22 bolt guns and beat up .22 semi-autos. The small .22 revolvers must have been popular in Australia. I saw another one at a location I cannot recall. There was the badly rusted 1916 Spanish Mauser carbine and six old single and double barreled shotguns. There was a model 92 Winchester, missing a magazine, and badly misused. There was a Model 4 Remington Rolling block in .22 rimfire, a bit rusty but probably serviceable. I would have thought to rehabilitate three of the shotguns and the Remington Rolling block. The store employees did not consider them worth the effort. The double hammered .410 made in Leige, Belgium seemed in pretty good shape. I thought it was cute, and looked to be foldable. An engraved Spanish double from Eibar might have been worth while. I could not be sure its forend was in the parts bag. 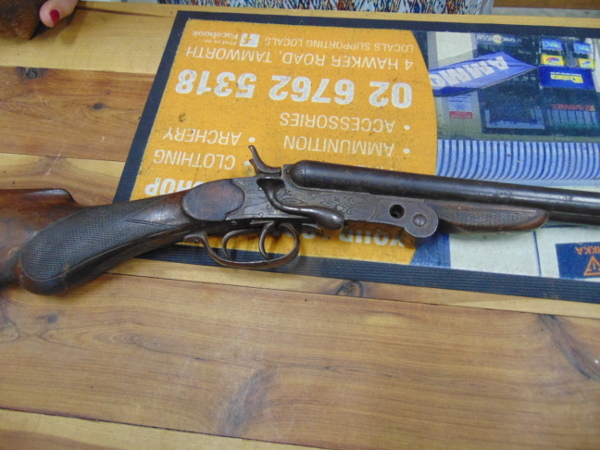 A utilitarian double by Iver Johnson, Hercules grade 12 gauge, looked in fair shape, and worth a couple of hundred. Maybe Australians don't like the side by side guns. The people at Calibre said only 1-2 percent of the people who turned in guns insisted the guns be destroyed. I checked with an employee at Tamworth firearms to see if he agreed. He said the number was about right. People who insisted a gun be destroyed were very rare. I asked him how many airguns were turned in. He said, definitely more than 20%. There were 11 airguns in the guns turned in at Calibre, or 27%. One gun the Calibre shop kept was an M1 carbine made by Quality HMC during WWII. In Australia it is worth about $1,000. Since the confiscation/turn-in in 1996, they have become rare. It will likely be picked up by a collector. Amnesty turn-ins were strong at first, then settled down to a steady trickle of a gun or two a day at Calibre. It has picked up a bit as the amnesty nears its end, according to employees at both shops I visited. I was told the Shooters, Fishers, and Farmers party is lobbying for a permanent gun Amnesty. It makes sense for the authorities to encourage people to register guns that are "off the books". Another source assured me there are more guns "off the books" than there are registered guns in Australia. He referenced the statistic that only 13% of the estimated "banned" guns were turned in in 1996. About 640,000 were turned in and destroyed at that time. Another person told me that he turned in broken guns to receive $600 each in 1996. He watched in horror as a classic English double was destroyed before his eyes. More than 24 thousand guns will have been turned in to be destroyed or registered in the last three months. It is unknown how many were registered instead of being destroyed, but it is a significant number, perhaps more than half. With less than two weeks to go in the Amnesty, I was in Calibre Country when three classic firearms were brought in to be registered. They were a pre-1964 model 70 Winchester in .222 Remington with a quality, European, Kales 6X scope, a nice Hollis double barreled 12 gauge shotgun, and a CZ Bruno .222 with a factory set trigger, a heavy barrel and a Burris variable scope. All had seen considerable use, but were quite serviceable. I overheard "they were his father's". I wonder how many father's faithful firearms are still out there. A perpetual amnesty seems even more desirable. I saw few used guns at the shops. I was informed that used guns are immediately purchased, and do not make their way to the display racks. The Australian system of extremely tight regulation and control is not acceptable to the American electorate. America has the advantage of the Second Amendment. Australia may have inherited the Englishman's right to arms, but the courts stopped recognizing it a few decades ago. In Australia, the political clout is with legal gun owners. The more people that register guns in Australia, the more they will be able to reverse the heavy handed regulations. Police responded about 7:30 a.m. to the home in the 6400 block of Woodward Avenue in Hammond, Indiana, where they found the male inside the home with multiple gunshot wounds in his chest, according to a statement from Hammond police. He was pronounced dead at the scene. Witnesses said the male, whose age was unknown, entered the home and announced the robbery while threatening them with a gun, according to police. He then forced the occupants into the basement. Grubb said he thinks the man was trying to break into his home because he also went around the side of the home to look into other windows. "If you look in the window, you can see all the stuff we have -- the TV and all the nice stuff. I imagine he was trying to get something," Grubb said. Grubb said he grabbed his gun and that’s when the man is seen dashing off. 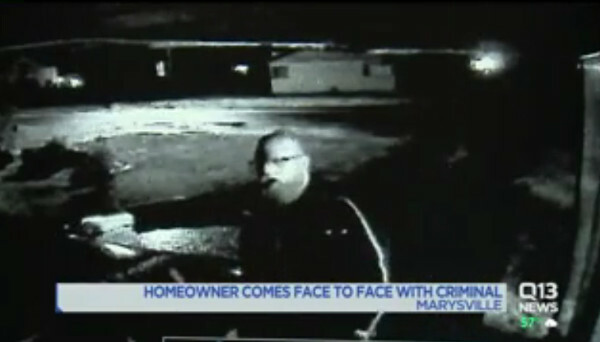 A woman told Action News Jax off-camera that this same guy tried forcing his way into her home and she called police. And how is locking up guns and ammunition supposed to prevent suicides, especially by men who preferentially own guns? Another conclusion, likely as valid, is that rural areas with guns prevent women from committing suicide, as the rate of women committing suicide is almost exactly as reduced as the rate of men is increased, in rural areas. Other possibilities are likely. There are more available women in urban areas. Men with women available are less likely to commit suicide. The obvious conclusion is that more women should be making themselves available in rural areas to keep the suicide rate down. At the same time, the suicide rate for women would be decreased. But that obvious solution is not politically correct. It is much easier to blame inanimate objects such as firearms. Suicide is a complex affair. Countries with lots of guns have a high suicide rate and low suicide rates. Countries with few guns have both high and low suicide rates. It is the overall suicide rate that maters, not the number of suicides performed with a particular method. Overall suicide rates in the United States have risen from 11.08 in 1997 to 12.93 in 2014. The number of guns per capita has risen from .97 to 1.21 in the same period. But the percentage of suicides committed with guns decreased from 60% to 49%. If guns were the cause, you would expect the percent of suicides with guns to rise, not fall. Many other methods of suicide are available. A search on the Internets confirms this obvious fact. Web sites are available that describe suicide methods in detail. The idea that suicides can be meaningfully prevented by requiring guns to be locked up is not proven. It seems decidedly counter-intuitive. Suicides are not capable of turning a key? In Australia, as suicides with guns have dropped, suicides with other methods have risen, just as expected. 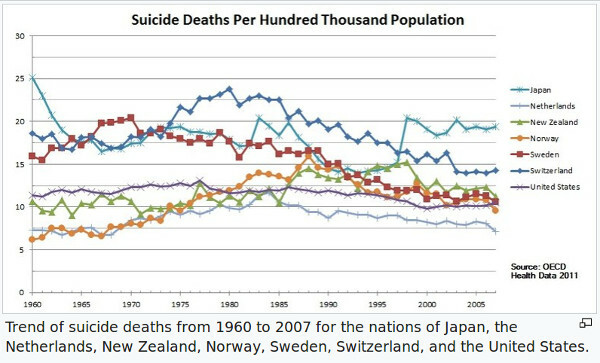 Suicide rates are not dependent on the availability of a particular method. In a modern society, many methods are commonly available. In Australia, the most common method is strangulation/hanging, with suffocation close behind. Suffocation commonly involves a plastic bag. A common problem with statistical studies is confirmation bias. Authors of studies find what the expect to find in their work. It appears to be the case here. The medical community has been pushing poor "studies" that promote the strict regulation of firearms for decades. This appears to be another such effort. At around 5 a.m., Elizabeth Police responded to a 24-hour car wash located on Edgar Road just south of the Bayway Circle where they found the robbery victim and the shooting victim, according to the preliminary results of an investigation by the Prosecutor’s Office’s Shooting Response Team (SRT). An investigation found that the retired officer was physically assaulted just before the shooting took place, Union County Prosecutor Thomas K. Isenhour said. CINCINNATI -- A corner store clerk shot and killed a would-be robber Wednesday night in South Fairmount, according to Cincinnati police Capt. Dennis Swingley. Further investigation revealed the owner of the store was inside when a white male entered and appeared to take some beer out the door without paying, police say. Authorities say the owner then confronted the man in the north parking lot and held the suspect at gunpoint and demanded the man return the beer. The man complied, but at some point during the confrontation the store owner fired a shot, said Martinez in a report. As the assault continued, the man told the victim that he was a virgin, and this was his first time, according to the report. Another jogger who was carrying a flashlight and a handgun heard the victim scream and ran over to help. The affidavit said the jogger told police he shined his light in the direction of the screams and saw the victim on her back and the attacker on his left side on top of the victim. The jogger pointed his gun at the suspect and demanded he get off the victim. The attacker stood up and was naked from the waist down, the affidavit said. A bill that would allow Wisconsin residents to carry concealed weapons without a permit has advanced out of a state Senate committee. The legislation makes a number of changes to the state’s concealed carry law, which include allowing anyone who can legally own a gun to carry a concealed weapon in most places. It would also allow permit holders to have a gun on school grounds, if they are within a few feet of their vehicle. Felons, who currently are not allowed to have guns in Wisconsin, could also possess muzzleloaders and firearms made before 1898. State Senator Van Wanggaard (R-Racine) chairs the Senate Judiciary Committee, which approved the bill Tuesday on a 3-2 vote. He noted the state already has an open carry law, and he believes extending that right to concealed carry would create “less tension” in situations where a person has a weapon on them. “I think this is good policy,” he said. In 2003, leftist judges on the Wisconsin Supreme Court moved to gut the amendment of any meaning. Judge Prosser argued that the right is neither fundamental, nor of an individual nature. In that decision, the justices cited several other states that had effectively neutered their own state constitutions' right to arms. The Court refused to apply the words of Wisconsin's new amendment. The 2003 case was an example of an "everyone else has neutered amendments we do not like" argument. As a harbinger of things to come, the majority begins its analysis not with the statute to be examined, but with a discussion of the Second Amendment of the United States Constitution, examining the constitutional right to bear arms. Majority op.,¶¶8-12. The Constitutional Carry bill, SB 169 and its companion in the Assembly, AB247, will bring the Wisconsin statutes in compliance with the Wisconsin State Constitution and with the Second Amendment. No fee would be required to carry a firearm either loaded or concealed. That was the state of the nation when the Second Amendment was ratified on December 15, 1781. Constitutional Carry is only a small additional step for Wisconsin. 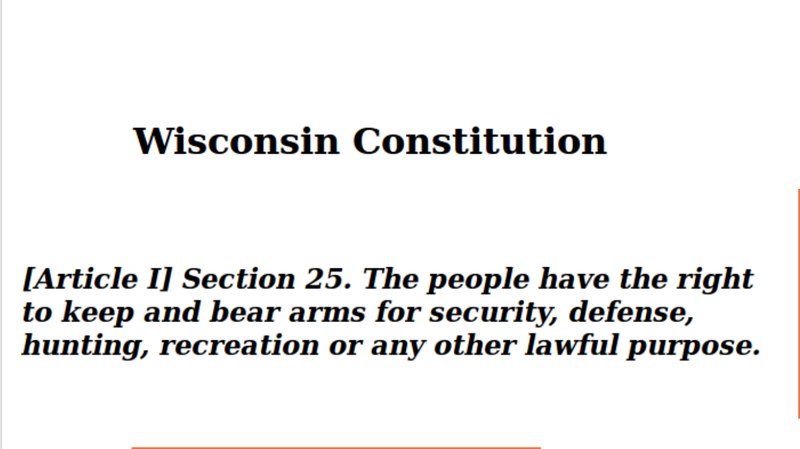 Wisconsin does not require a permit to carry firearms openly. No permit is required to carry knives openly or concealed. The Wisconsin permit system is one of the most reasonable in the United States, with issuance of the permit required when a person is not prohibited from carrying arms, passes any of a wide variety of courses of instruction, and pays the $40 fee. The current permit is good for five years and can be renewed over the Internets. No picture or fingerprints are required. The bill contains a number of other reasonable reforms, such as allowing non-residents to obtain a Wisconsin carry permit. Here are a few others. Eliminates prohibitions on carry in public buildings generally, but allows posting under the trespass law for certain sensitive government buildings such as police stations, prisons, and secure mental health facilities. Eliminates the prohibition on the possession of electric weapons, such as Tasers. Changes the state definition of "firearm" to be congruent with the federal definition that excludes muzzle loaders and antique and replica firearms. The bill has significant support in the Assembly and the Senate. There are 39 co-sponsors in the Assembly, and 11 co-sponsors in the Senate. There are 99 voting members of the Assembly. 64 are Republican. There are 33 voting members in the Senate. 20 are Republican. Two separate sources have told me the legislature has the votes to pass the reform, and that Governor Scott Walker will sign the measure. We should know if the sources are correct in a couple of months. Police say one of the men shot the driver in the back. The victim returned fire, hitting one of the men in the leg. Officers arrested that man a short distance away from the initial scene. Police are looking for the two women and the other man. POCATELLO — A video reviewed by the Idaho State Journal shows the brutal assault on a local couple this past weekend that ended with gunshots and left two victims beaten and two of the apparent attackers stabbed. The video is from a West Center Street business' security camera and was provided to the Journal this week by a source who wanted to make sure the truth was reported about the early Saturday morning incident. Lopez drove the stolen guns back to the victim at which time the victim took one of the stolen guns out from the trunk, loaded a chamber into it and told Lopez to get on the ground while they waited for police to arrive. Lopez later changed his story stating he had stolen the guns [four shotguns] during the middle of the night while the daughter and homeowner were sleeping and the firearms remained in his trunk until they were returned. Police said an employee at the tobacco shop told them he shot at two Hispanic males who were trying to rob the store. Police have not said whether any weapons were recovered. One suspect got away. The other, 18-year-old Jose "Mario" Velazquez, died at the hospital. "She told me that he came into the store like a normal person with a mask on. Told everybody to get down, and pointed a gun at her face, told her to empty the cash register," Peter Perez said. Police say the clerk shot Mendez in the torso after he tried to rob the Circle K on Candelaria and Eubank. After being shot Mendez ran from the store and collapsed nearby. Josh Waldron of Silencerco has been one of the strongest voices pushing for reform of the antiquated and poorly conceived National Firearms Act. In 1932, when the Act was passed, no one gave any explanations for including gun mufflers, called silencers. The inclusion of silencers never made any sense. In the rest of the "developed world", silencers are often regulated much less than guns. In New Zealand, a liberal mecca, anyone with cash can buy silencers over the counter. Even children are not barred from doing so. Most of Europe considers silencers to be a safety and noise pollution device. New Zealand has not had a rash of "silencer crime". England has not suffered from an abundance of criminals armed with silencers. Americans have suffered under the over-regulation and extreme taxes imposed on users of silencers for 70 years. Millions of people have lost hearing because of the public health blunder of the Roosevelt administration in the 1930's. The 1934 National Firearms Act has had small areas of common sense interpretation added over the years. 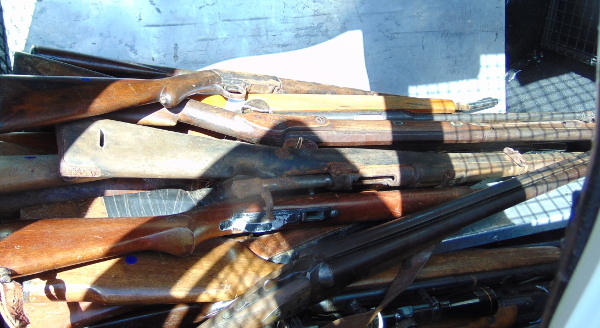 Muzzleloading guns are considered antiques, and are not regulated under the act. That is why a silenced muzzleloader is not burdened with the extreme red tape and taxes that ordinary silencers are. To obtain an ordinary silencer, a target shooter or hunter has to have his fingerprints taken, apply for a federal tax stamp, pay $200, wait six months to a year, and then, maybe, obtain his silencer. Congress is considering reducing those burdens. A reform law would regulate silencers the same as ordinary rifles and shotguns. The current restrictions do not apply to the Maxim 50. To obtain a Maxim 50, simply find it at the SilencerCo store online. The price is $999. The rifle is the very successful Traditions Vortek Strikerfire. 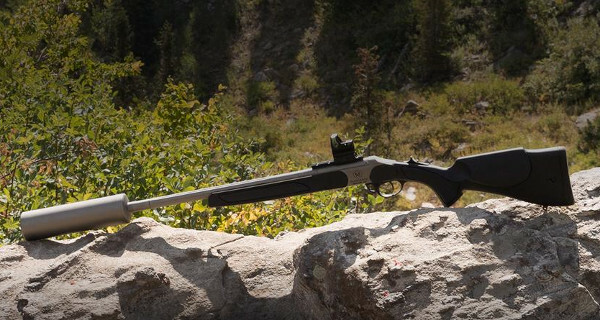 Pay the price and the rifle and integrated suppressor will be delivered to your doorstep. There are some additional constraints in the most restrictive political areas. New Jersey, Washington D.C., New York City, and Illinois require the Maxim 50 to be shipped to a Federal Firearms License, who can then transfer the rifle to you. The rifle needs to be shipped to a physical address, not a post office box. Other than those restrictions, I believe the Maxim 50 can be purchased mail order all over the country, to adults over the age of 18. $999 is not a bad deal for an excellent rifle and silencer combination. The rifle and silencer together weigh less than eight pounds. That is a good weight for a .50 caliber rifle. I suspect the Maxim 50 will quickly be sold out and back-ordered. At $999, you are paying about $500 for the silencer. The rifle, separately, sells for about $500. SilencerCo's introductory offer includes a limited edition, all-weather carrying case. The introduction of the Maxim 50 is another nail in the coffin of the ill-considered over-regulation of gun mufflers in the United States. 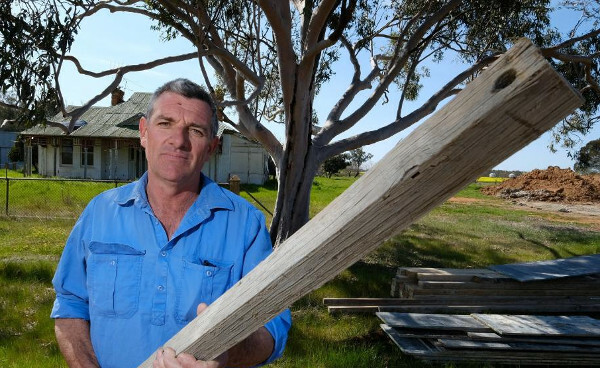 A farmer who armed himself with an unloaded gun to protect his family from a knife-wielding thug says he fears the justice system is “stacked against” victims.Father-of-three David Dunstan, 52, was left reeling after police turned up at his property near the NSW-Victorian border to investigate the home invasion — and confiscated the farmer’s legal firearms while they were there, the Herald Sun reports.It came after the cattle and crop farmer confronted a teen armed with a knife and a block of wood who knocked on his back door about 3am last Thursday.“He had a seven foot log of red gum in his hand a knife concealed in the other,” Mr Dunstan said. I know a little about the intricacies of firearms law in Australia. I am not surprised he had his guns confiscated. He may not get them back. He may lose his license. The critical statement is that he called to his wife to get the key to gun cupboard. My understanding is that is strictly forbidden by Australian law. License holders are forbidden from allowing anyone else to have access to their firearms, even if the other people also have gun licenses. A wife and husband who have licenses must have separate gun safes. The fact that his wife knew where the key was may be considered "unsafe storage", which requires mandatory confiscation of the guns. The law was changed in May, 2017, but will not go into effect until November. In the 1996 National Firearms Agreement, Australia installed a holistic suite of firearm-related public health interventions. These spanned from compulsory firearm seizure in domestic violence cases to the requirement to show “genuine reason” for owning each firearm (now rolled back in several states); universal firearm registration; enforced safe storage regulations; definitive denial of the “right to bear arms”; and many others. The keystone of gun legislation in England and Wales was to gradually deny any legitimate use of firearms for self defense. The United States incorporated an Englishman's right to arms into the famous Second Amendment to the United States Constitution. Australia’s ban on practical self-defence sets it apart from most other countries. Almost none prohibit non-lethal means of self-­defence, while many permit ownership of firearms at home. A few (including most US states) allow the carriage of firearms for self-defence almost anywhere, subject to a permit system. Australia’s prohibition on practical self-defence is relatively recent, emanating from the 1996 changes in firearms laws that followed the Port Arthur massacre. Not only were many types of firearm prohibited, but Australia embraced an international push to prohibit civilian ownership of firearms for self-defence. In 2011, Gold Coast man Kane Robert Cook was charged with manslaughter after shooting an armed intruder dead in his home. Police confirmed four men were waiting for Cook in his home, and after a scuffle, he shot one man in the leg with a World War II Luger 9mm pistol. The intruder died of his injuries and the ensuing case took two years to resolve. When charges were eventually dropped, Cook's criminal lawyer Bill Potts told 4BC radio it was unjust. "How could the justice system find a man defending who his own house and own life against armed masked robbers find himself charged with manslaughter of one of them?" Potts said. "He's had a life sentence hanging over his head for the last two and a half years." There are movements in England, Canada, and Australia to restore an effective right to use weapons to defend your home. It is growing, but has little support in the halls of power and the media. These incidents show the wisdom of the castle doctrine in most American states. It's origins are in English law. Those origins are carefully ignored by the establishment media in England, Canada, New Zealand, and Australia. A report from LMPD states a man tried to rob a business at that location. The suspect and an employee got into an altercation and the suspect was shot, police said. Police said they are unsure what type of exchange took place between Branch and the woman, but he sustained a single gunshot wound as a result of the encounter. "The suspect encountered a lone female that was working inside the building. The suspect, in the course of that encounter, was shot," said Knightale Police Chief Lawrence Capps. She said she then pulled out her cell phone and began recording the incident on video. One of the four men slapped the camera out of her hand and two of the men jumped on her boyfriend and started beating him up, she said. When she told the men to get off her boyfriend, the two other men knocked her down and began beating her, the woman said. She said the two men were on top of her and she feared for her life. The woman had a 5-inch self-defense knife in her purse that she was able to reach. She then thrust the knife toward the men who were on top of her, stabbing them both. But they didn’t get off her until a nearby resident who saw the beating shot a pistol into the air, causing three of the men to flee on foot, the woman said. One of the men who’d been stabbed did not flee until the individual with the pistol told him to leave at which point the stabbed man got into the car that the four had arrived in and drove away. As I talked to the manager, I mentioned that I understood it was illegal to carry a pocket knife. She said that yes, she used to carry a small knife all the time, but she does not do so anymore. Now, after almost three months in Australia. I admit, I was wrong about knives and the ability to carry them. 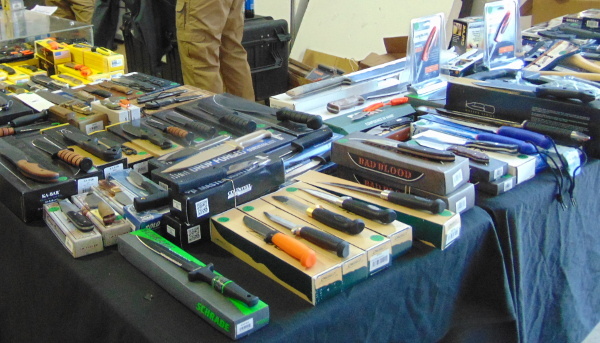 In rural Australia, knives are common, and are sold over the counter in many stores. It is true that you are not allowed to carry a knife without a "good reason". I was quickly informed that a "good reason" is easily met. Informed people told me that there were two reasons that nearly always would be accepted. First, that the knife was a "rescue tool" in time of need. Not for self defense. Self defense is not a valid reason. But to aid in an auto accident, to cut a line, or other rescue purposes, is valid. Second is "food preparation". Slicing a salami, peeling fruit, or other food preparation tasks are valid reasons. There are two places where carrying a knife will get you in trouble. Knives are forbidden in bars and in schools. Not carrying a knife there is not too difficult. Double edged knives require a permit. Spears do not. Walking with a spear in an Australian city will draw attention. The other point about Australia that makes pocket knife carry plausible is the reasonableness of Australian police. I was impressed. Every Australian policeman that I encountered was polite, willing to be reasonable, and easy to engage. If you work at being difficult and abusive... your mileage may vary. A knife vendor told me, when I showed him the Victorinox Swiss Army knife that I had been toting about in Australia "there is no reason for any law abiding person to fear carrying a Victorinox, as long as you stay out of bars and schools." He, quite reasonably, asked how many times I had been searched by a policeman during my life. I have to admit, in a long life filled with political action, and some close scrapes, the last time I was searched by a policeman was in 1970 during riots on the University of Wisconsin campus. They did not do a very good job. My impression in Australia is that being searched by the police is very rare. A caveat must be mentioned in all this. I rarely saw anyone carrying a knife that was visible. Knives with pocket clips are common in the United States. I see people with them all the time. I did not see one in Australia, and I was looking. I looked when I attended the Shot Show in Brisbane. There were thousands of people. I did not see one carrying a knife with the pocket clip visible. The attitude may be, if no knife is showing, there is no reason for the police to ask why it is being carried. If you are in a remote rural area, camping, or walking in the bush, I doubt that carrying a belt knife, a hatchet, or a machete would be a problem. In the city, it would. Perhaps, on the next trip to Australia, I will bring a pocket knife with a clip and see if the two reasons for carry hold up. A weekend shooting that killed a 29-year-old man is believed to be an act of self-defense, the Athens police chief said. Christopher Demond Carter, of Harvest, was killed by his ex-girlfriend's new boyfriend on McClung Lane after shooting and injuring the couple, according to Chief Floyd Johnson. The Cass County Sheriff's Office says deputies responded to a report of an intruder. When they arrived they learned a man had made entry into the home but ran off when the homeowner shot at him. According to Tucker, an argument broke out and Lee pointed his rifle at the homeowner. The homeowner reportedly shot one time, killing Lee. Pearl River County Coroner Derek Turnage said Lee was shot in the abdomen. Small white square in distance is 1000 meter target. On Saturday, 16 September, 2017, my friend, Curtis Eykamp, was showing me a bit of Australia. He wanted me to see a captured Turkish gun from WWI, in Manila, NSW. We were traveling from Gunnedah, through a gorgeous countryside, dotted with cattle and the ubiquitous road killed kangaroo. Many people have noted the resemblance to the inner valleys of Southern California, (with different trees, and kangaroos). Roy Eykamp, a few months short of 100 years old, was along for the ride. Off in the distance, I spotted a white square on a berm. "That looks like a range", I said. "Maybe a thousand yards. Here in Australia, a thousand meters." Half a mile further along, red flags blowing in the wind made it clear that a shoot was in progress. It was the Nioka range, developed by Matthew Miegel, on the Nioka property. A muzzleloader club was having a shoot at the range. They were only too happy to talk to a Yank writer. One of the peculiarities of the Australian mesh of regulations put in place in 1996, was that pre-1900 muzzleloaders are not considered legal guns, but reproductions are. 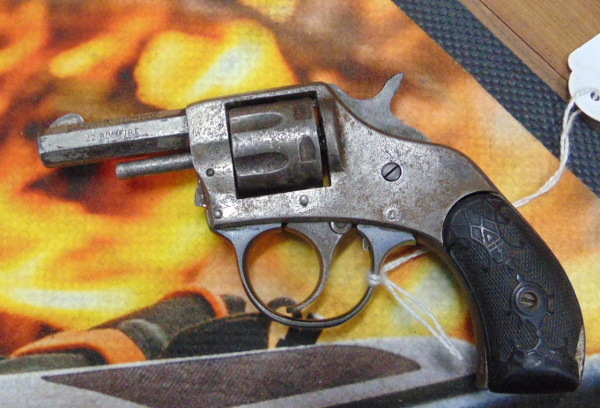 You may own a pre-1900 antique, but you are not allowed to shoot it without a gun license. Reproductions require licenses to possess, and they must be registered. The club was having a good time loading and firing muzzleloaders, mostly flintlocks. The range was a full 1000 meters long. The targets were closer for this shoot. The 1000 meter target will be used in the "Buffalo Shoot" to take place next weekend. The theme of the shoot is a loose recreation of the Adobe Walls battle that occurred in 1874 in the northern panhandle of Texas. During that battle, buffalo hunter William "Billy" Dixon made the famous long range rifle shot that stopped the siege of Adobe Walls. I was told that one contestant reliably and repeatedly hits the bullseye at 1000 meters with his black powder Sharps rifle and iron sights. There were battles between Aborigines and European settlers not far from where the range is located. Battles at Yarramanba (page 23) in 1827 and at Borambil (page 53), in 1828, involved hundreds of Aboriginals against a handful of Europeans armed with muskets. The accounts were not widely circulated at the time. It is not clear exactly where the fighting took place. In the U.S.A., someone might design a Yarramanba shoot, but it may be too politically incorrect for NSW. 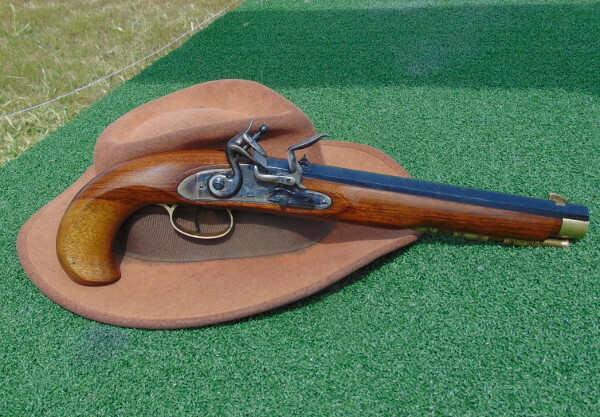 A happy result of the current gun amnesty is that one of the shooters was able to register his flintlock pistol. He registered 21 firearms during the current amnesty. There are plans to have the range certified for pistols in the near future, in conjunction with a pistol club. Membership in a pistol club is necessary for legal ownership of a pistol. 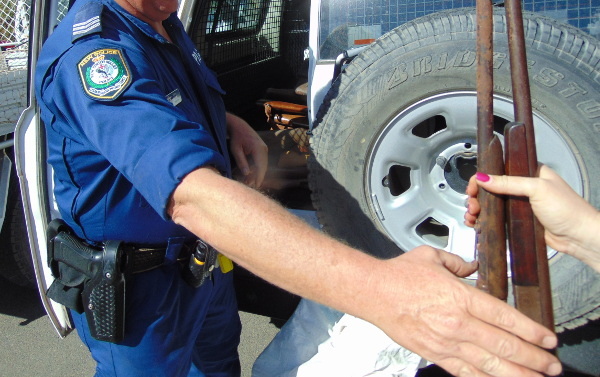 Some historic guns are being turned in for destruction under the ongoing amnesty. You can see an original caplock (third from top, under the old Browning .22 semi-auto, above the rusty 1916 Spanish Mauser). This picture was taken of the back of a police van, as the guns were carted off. 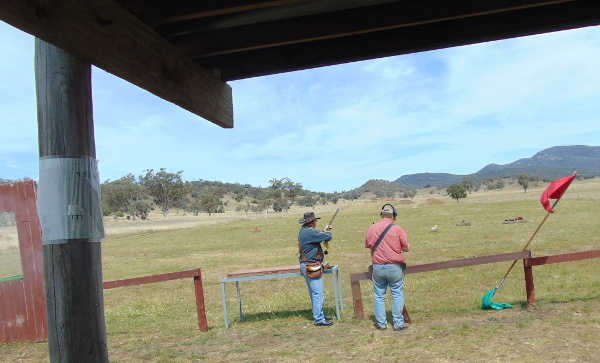 A difference between New South Wales regulation and that of Queensland was pointed out by people who showed me some miniature cannon that met the legal requirements for muzzleloaders in NSW. 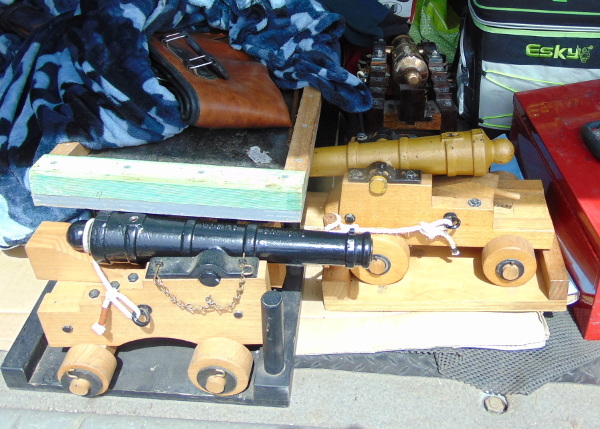 In NSW, the cannon must be small, or they are not legal. In Queensland, the cannon have to be big, or they are considered "concealable". In the United States, in Florida, a pistol must be concealed if you are in a car, and do not have a carry permit. In North Carolina, a pistol carried in a car, without a permit, must be visible. Australia does not have a monopoly on contradictory laws between states. While I was interviewing people, the participants learned that Roy Eykamp, Senior, was sitting in our vehicle. Attention quickly shifted to this 99 year old well known farmer, inventor, and producer of Kikuyu seed. Matthew Miegel deserves credit for his far thinking development of a 1000 meter range. I heard rumors it might be extended to 1600 meters, almost exactly a mile. There seems to be enough room on the Nioka property. Australians are adapting to the stringent requirements of the 1996 gun laws. The number of shooters and the number of registered guns, are growing. This week, twice-failed presidential candidate Hillary Clinton released her new book, “What Happened,” which chiefly serves to assign blame to the myriad politicians, journalists, organizations, countries, prejudices, and technologies she claims caused her defeat. Gun rights supporters will be happy to know that NRA is featured prominently. In addition to apportioning NRA its well-deserved share of the blame, Clinton seeks to rewrite her own history on the gun issue and urges her fellow Democrats to ignore political reality and continue to champion gun control. Clinton repeatedly acknowledges NRA’s influence on the 2016 election and the broad political landscape. In the 1990s, my husband fought hard to pass both a ten-year ban on assault weapons and the Brady Bill, which, for the first time, required background checks on many gun purchases at federally licensed firearms dealers… The NRA funded an intense backlash to the new safety measures and helped defeat a lot of Democratic members of Congress in the disastrous 1994 midterm elections. Then, in 2000, the NRA helped beat Al Gore. As for the NRA, it kept its promise to do everything it could to stop me. All told, the gun lobby spent more than $30 million supporting Trump, more money than any other outside group and more than double what it spent to support Mitt Romney in 2012. About two-thirds of that money paid for more than ten thousand negative ads attacking me in battleground states. Clinton’s recognition of NRA’s role in her and her husband’s defeats should motivate gun owners in the continuing fight to defend the Second Amendment and serve as a stark warning to anti-gun politicians. Jefferson County sheriff's deputies were dispatched just before 10:30 p.m. on a report of a disturbance at a home in the 200 block of Bayview Drive, said Chief Deputy Randy Christian. A woman called 911 to tell authorities that her husband had yelled from the back of the house for her to call 911 and then she heard what she believed to be a gunshot. Once on the scene, deputies found an adult male victim dead on the floor in the house. The homeowner, Christian said, was taken to the hospital for treatment of a cut to the head. “It appears he was yelling to get into the residence because he believed his kids were in the house. It turns out the kids inside did not belong to him,” said IMPD officer Aaron Hamer. Police say the suspect, identified as 34-year-old Percy Walker kicked down the front door, breaking the deadbolt and storming inside. That’s when he was shot and killed by a man in the apartment in front of two young kids, just 2 and 4 years of age. SEATAC, Wash. - King County deputies say a homeowner fatally shot a suspect who broke into a home in SeaTac. The shooting happened in the 17600 block of 38th Avenue South Thursday morning. SELMA, Texas - The Texas Rangers are investigating, and a suspected carjacker is dead after being shot in Selma by his intended victim. Heathcliff Garcia, 34, died at the San Antonio Military Medical Center after a Thursday afternoon shooting near the 8000 block of Old Austin Road. LUNENBURG – Lunenburg County Commonwealth’s Attorney Robert Clement announced today that he and the Multi-Jurisdiction Grand Jury have agreed that the store clerk at the Little B Convenience Store in Victoria will not be prosecuted for the fatal shooting of an armed robber. Troopers tell Eyewitness News 30-year-old Cody Englert from Jersey Shore tried to break into a house on Fourth Street near Avis early Wednesday morning. State police say he was shot and killed by someone who lives at the home. That person is cooperating with the investigation. An arrest report states that police responded to a call where a homeowner was "holding a burglar at gunpoint with a shotgun." Officials say when officers arrived, they found Hall being held at gunpoint by the owner of the home. According to Tregre, the homeowner heard two voices in the back and went to the door to see what was happening in his yard. That's when he says Ferrygood forced his way into his home and the homeowner opened fire. Deputies later found a gun in the backyard they believe belonged to one of the intruders. The Sheriff's Office says there is video evidence of what happened. And according to police records, Ferrygood was arrested for shooting five people on Christmas Eve, 2008, at a nightclub in St. James Parish. Ferrygood's cousin, Andrea Wilkins says he got out four months ago, but regardless of his past, she doesn't think he should have been shot. 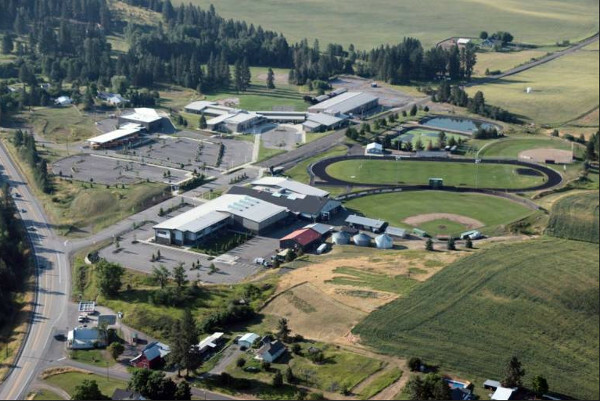 The murder of Sam Strahan at Freeman High School in Washington State, appears to be another result of the American media's obsession with school shootings. Guns have been around for hundreds of years. Semi-automatic pistols have been common for over a hundred. But the rash of school shootings only escalated in the middle 1990's, after the federal bans on guns in schools. The most likely explanation is the copycat effect. The documents and his classmates detailed troubling behavior by Caleb Sharpe, saying he brought notes to school about doing "something stupid," was obsessed with past school shootings and posted videos online showing him playing with guns. Sharpe, a sophomore at the school of 300 students, also had left a suicide note at home for his parents, the records said. Freeman High School in the tiny town of Rockford has not responded to calls for comment on how they dealt with Sharpe's behavior outside of counseling for his suicidal thoughts. What the Pacific Standard article missed is the perceived political benefits to the establishment media from exaggerated coverage of school shootings. Several studies have confirmed the overwhelming leftist bias and anti-Second Amendment attitudes in the establishment media. Perhaps the best study is "The National Rifle Association and the Media: The Motivating Force of Negative Coverage" by Brian Anse Patrick. The establishment media culture sees opportunity to push its desired restrictions on firearms ownership with school shootings. The media spends a disproportionate amount of time effectively glamorizing school shooters when compared to other violence. The push for political action has the effect of providing more incentive for school shootings. There are numerous ways the media can cover school shootings while providing little incentive for more school shooters. The media has been told, again and again, how it could be done. Clayton Cramer wrote a paper on this in 1993. It was published in a the Journal of Mass Media Ethics, 9:1 [Winter 1993-94]. It won First Place, Association for Education in Journalism and Mass Communication Ethics Prize, 1993, Undergraduate Division. It has been widely written about in other publications, such as the Wall Street Journal. Author Loren Coleman, who wrote "The Copycat Effect, published in 2004, made these suggestions, among others. 1. Accept that these stories have an effect and that the way they are covered is important. 2. Stop glamorizing the deaths with wall to wall coverage. 3. Stop using cultural stereotypes about the perpetrators or victims. 4. Do not give details about the killing. That serves as a road map for copycats. 5. Give alternatives, such as seeking help or counseling. These recommendations could be implemented voluntarily by the media, if the establishment media were serious about reducing school shootings. The AP could include these requirements in its writers guidelines. The Cramer article has been around for 20 years, and won a prize for ethics. "The Copycat Effect" has been available for over a decade. Any thoughtful person can see the connection between making anti-heros of school shooters and the potential to tip unbalanced people over the edge. The media would rather use these events push a political agenda. They could prevent children from being murdered, but they will not. As Cramer noted, the coverage of school shooting is at least 8 times as large at that of similar mass homicides that do not involve guns.